Our spring webinar series features engaging, multisensory solutions for kindergarten readiness and K–5 handwriting instruction. 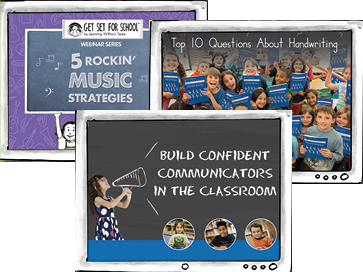 From getting your essential handwriting questions answered to learning how to incorporate music in the classroom, these webinars are the perfect burst of training to get your teaching ready for spring! Top 10 Questions About Handwriting | NOW available on demand! Get the answers to your handwriting questions with this introductory webinar that’s perfect for discovering fun and easy ways to implement handwriting instruction in your classroom. 5 Rockin’ Music Strategies | NOW available on demand! Groove your way through fun, musical activities to learn solutions for making kindergarten readiness and K–5 handwriting instruction a multisensory, active experience! Build Confident Communicators in the Classroom | Available on demand! Build your way to better teaching with this webinar that’s designed to strengthen your students’ communication skills in the classroom. NEW! Handwriting Reimagined | Available LIVE on May 3! Reimagine your teaching strategies with the latest tips and tools for multisensory handwriting instruction. This brand new webinar features strategies for leveraging technology to teach handwriting—plus, find out about our new grade level!